A visit to Greens in San Francisco is a celebration of the senses. Dip your spoon into a bowl of butternut squash soup and delight in the delicate harmony of lightly caramelized onions and apple confit blended with a hint of calvados. Feast your eyes on a salad that marries fresh ripe figs with Kodata, Mission and Calmyra olives, melon, watercress and creamy goat’s cheese. Inhale and delight in the delicate scent of virgin olive oil simmering with fresh herbs and garlic — a hearty ragout in progress. Feel the freshness of the bread as you pull it apart. Hear the gentle hubbub of contented dining. In a city that regularly ranks as one of the world’s top restaurant destinations, Greens is both legendary and unique. The Zen influence runs deep — but in the true Zen spirit of understatement, it is imperceptible. Similarly, the restaurant does not proselytize vegetarianism. “Nowhere will you see the word vegetarian or vegan. That’s what we are, but we don’t talk about it,” says executive chef Annie Somerville. On the menu, they simply describe the dishes as they are. For example, crostini with warm cannellini beans and wilted Green Gulch chard flavored with olive oil, garlic and sherry vinegar. 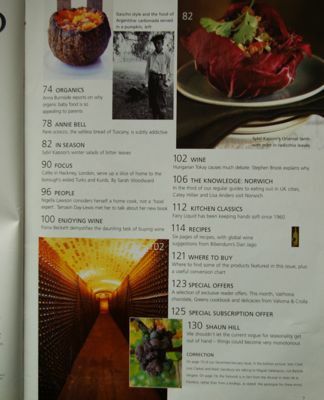 The Food Illustrated layout of my Greens restaurant story. Green Gulch Farm in Marin county, less than an hour north of the city, is a residential Zen community and bountiful organic farm. Year-round it provides the restaurant with seasonal produce, from chard, leeks and winter squash to flowering herbs — a myriad of fresh garden edibles tended with care. What the restaurant can’t get from Green Gulch, it sources from an extended family of growers and organic farmers’ markets. In addition, several times a year, Somerville joins forces with Wendy Johnson, head gardener at Green Gulch, and together they run workshops on growing and cooking vegetables, organic gardening and the changing seasons. Upriver in the Sierra foothills, farmers grow olives and grapes. South in the Salinas Valley, immortalized by John Steinbeck in The Grapes of Wrath, are abundant crops of lettuce, berries and onions. Toward the coast, the Santa Cruz and Monterey areas yield a rich harvest of artichokes and spinach. 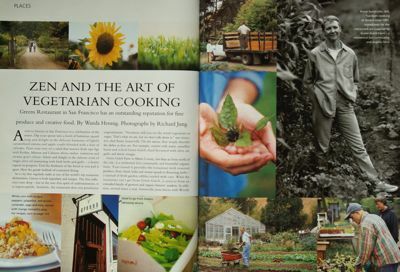 The Food Illustrated story on Greens by Wanda Hennig with photos by Richard Jung. Greens opened in 1979 as part of the San Francisco Zen Center, which includes the City Center, Green Gulch Farm and the Tassajara Zen Mountain Center, located in Carmel Valley about a three-hour drive south of San Francisco. In the winter months Tassajara functions as a remote monastery, and in summer it is a resort run by Zen students and monks. It is renowned both for its hot springs and its wonderful vegetarian food; students come from all over the world to gain experience in the kitchen. In fact, the inspiration to open Greens came from the success of the Tassajara kitchen, which is where Annie Somerville was working. Then in 1981, she joined the staff at Greens. According to the Chanyuan Qinggui, (which translates as Regulations for Zen Monasteries), a 10-volume tome written by a Chinese monk known as Zongze of Mount Zhanglu in 1102 AD, the tenzo, or head cook, is one of the most important people in a Zen monastery. The opening spread to my Food Illustrated story shows Annie Somerville, right, at Green Gulch Farm. Zongze’s detailed teachings include instructions on attitude of mind, the choice of ingredients, their preparation and how they should be eaten. Seasonal variety is emphasized as is the fact that food should be both visually appealing and enjoyable. 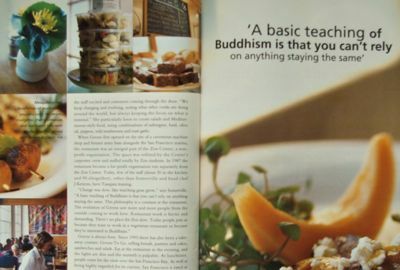 These teachings remain the focus of Zen cooking today. The Greens menu changes regularly. Each day there is a different soup, every other day a different pasta. Specials and appetizers alternate every couple of weeks. Annie Somerville says that she constantly invents new dishes to keep ideas fresh, the staff excited and customers coming through the door. She particularly loves to create salads and Mediterranean-style food, using combinations of aubergine, basil, olive oil, peppers, wild mushrooms and roast garlic. 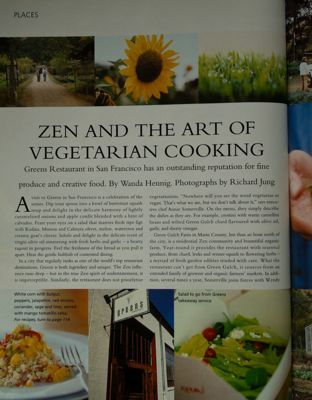 When Greens first opened on the site of a cavernous machine shop and former army base alongside the San Francisco marina, the restaurant was an integral part of Zen Center, a non-profit organization. The space was refitted by Zen Center’s carpentry crew and staffed totally by Zen students. In 1987 the restaurant became a for-profit organization run separately from the Zen Center. Today, few of the staff (about 30 in the kitchen and 90 altogether), other than Somerville and head chef J. Kenyon, have Tassajara training. “Change was slow, like watching grass grow,” says Somerville. What’s changed, what remains the same, since my story was first published? Greens is always busy. Since 1993 there has also been a take-away counter, Greens To Go, selling breads, pastries and cakes, sandwiches and salads. Eat at the restaurant in the evening, and the lights are dim and the warmth is palpable. At lunchtime, people come for the view over San Francisco Bay. 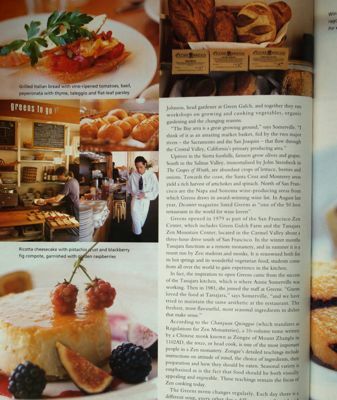 As well as being highly regarded for its cuisine, San Francisco is rated as one of the world’s most beautiful cities. Greens fuses the two attributes, with a floor-to-ceiling bank of windows offering a dramatic view across the sparkling water to the Golden Gate Bridge. A visit is an experience not soon forgotten. Greens Restaurant, Building A, Fort Mason (Buchanan at Marina Boulevard), San Francisco, California; (415) 771-6222. The restaurant and Greens to Go are open every day. 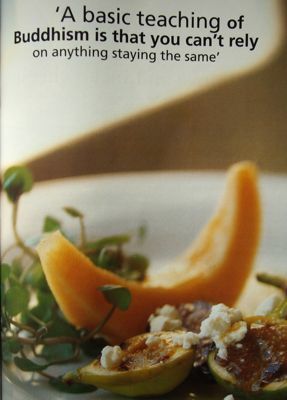 See Annie Somerville’s award-winning book, Fields of Greens: New Recipes from the Celebrated Greens Restaurant (Bantam). Also, The Greens Cookbook by Deborah Madison with Edward Espe Brown. 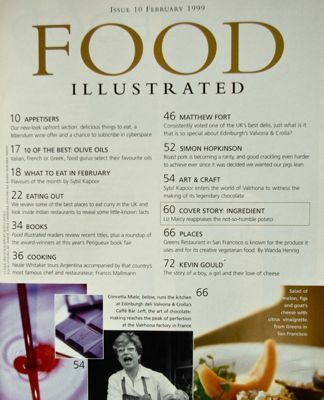 ‘Zen and The Art of Vegetarian Cooking’ (this story) was first published in the United Kingdom, in Food Illustrated magazine, in February 1999. Copyright © Wanda Hennig, 2010. I loved the article. It took me back years ago when I was first introduced to Greens. Makes me want to return, soon! Viva the green revolution! The place sounds great. Maybe Wanda will take me there some day. I am also a vegetarian and my body has never been in this good a shape. Being a vegan can really make you much healthier. Organic farms could actually save us from carcinogens and toxins. Organic farms will be the trend of the future coz we don’t like artificial stuffs inside our body.